According to the U.S. Department of Agriculture, Aspen Foods of Illinois has recalled approximately two million pounds of raw, frozen chicken products due to salmonella contamination concerns. The recall was announced Thursday, July 16. The company said in a news release that a link between the products and three people in Minnesota being sickened by salmonella had been determined. The products involved are stuffed and breaded and may appear cooked, but they are raw. They were shipped nationwide and have the establishment number “P-1358” in the USDA inspection mark and “best if used by” dates between July 14, 2016 and Oct. 10, 2016. 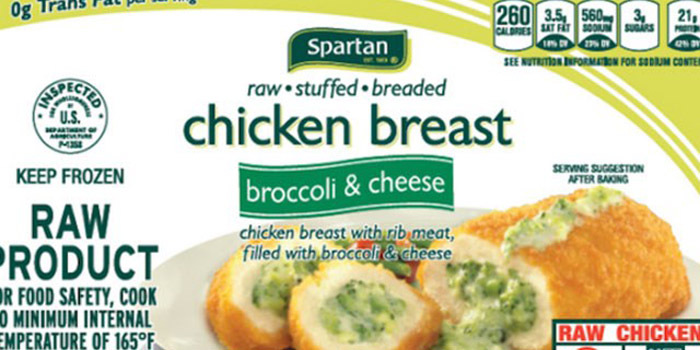 Brands associated with the recall include Kirkwood, Roundy’s, Safeway Kitchens and Spartan. More information on the recall and a full product list can be found on the USDA’s website.